Last week I ventured out a couple times. My back paid dearly but I was sick of being in the house. I hit up the dollar spot in Tarjay (Target if you don't want to be fancy but who doesn't want to be fancy??) 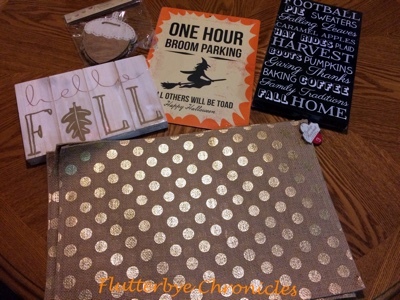 with my parents and scored these cute fall items. Most of it was in the $3 range except the witch sign it was $1 and it is double sided. 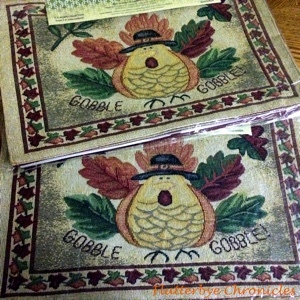 Then I went off with my sister and Mom and found these cute place mats for Thanksgiving at Ross for $4.99 each. There are four in each pack. My sister pretty much told me I had to have them. She is an enabler to my shopping addiction!! 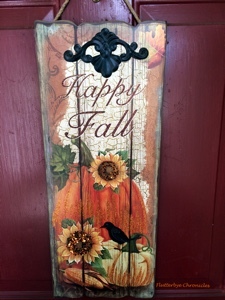 On the same day I found this super cute sign for my front door at Bealls outlet for $9.99. Also picked out by non other then my sister! 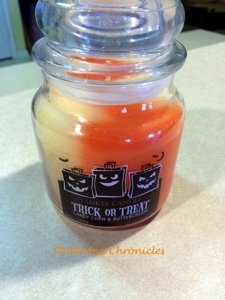 And this Yankee candle that smells like candy corn and buttercream for $9.99 and these are usually $24.99 so I was super excited about that. Have you picked up any cute items for Fall yet? All this stuff is adorable. With us moving soon, I can't buy anything like this and it pisses me off so bad. Really!! I love decor. But I can't pack more crap. I just can't. 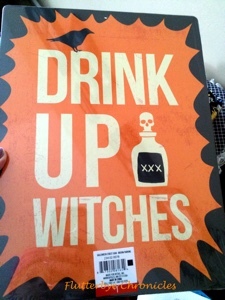 The "Drink Up Witches" is PRICELESS!!! Those are all really cute. And can't beat the prices!